Browse some of my latest creations, delivered to glorious locations between Monaco and St Tropez. Achieve your dream wedding cake. Designed, baked and created especially for you in my kitchen studio in Provence. 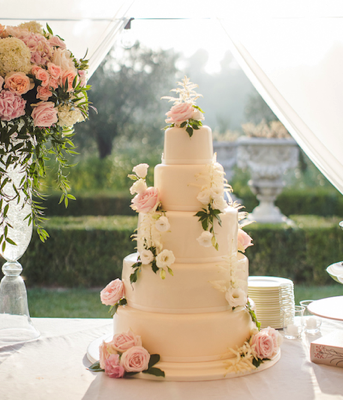 Delicious Flavours for Your ‘English Wedding Cake in Provence’. Outstanding quality and value for your bespoke, handmade Wedding Cake. Whether you have your own ideas, are seeking an original custom designed cake or wish to choose one of my established designs … I will make your gorgeous Wedding Cake a reality. Handmade, using only the best ingredients … so your cake will taste as good as it looks! After lots of discussion and exchanging of ideas to achieve the perfect look for your cake, it will be time to book your “tasting and consultation” so you can choose your favourite flavours! I hold the “tasting and consultations” in the relaxed environment of my home here in Bargemon where you can sample up to 3 cake flavours over a pot of tea, whilst we discuss and finalise all the details of your beautiful cakes. I calculate the price of your cake according to its size and how many hours it will take to create it! Naturally the more complex, large and original a design, the more a cake will cost. If you are planning a small celebration but want to wow your guests with an impressive multi-tiered cake, fake tiers can be incorporated into the design to create the grand effect with less expense and less waste … and no one else will know! The possibilities are endless … and I’ll work with you to deliver the most beautiful cake possible for your budget. Let’s create your perfect cake. - Your wedding cake budget. Then I’ll get back to you as soon as possible so we can discuss your design & flavour preferences … and start creating the perfect cake for you! Click here to see my wedding cake photos. Click here to see flavour options. Click here to see my price guide. Testimonial. L&K from their Wedding at Chateau Robernier. "We want to thank you for creating the perfect wedding cake for us - you really made it even more beautiful and so delicious! We are so grateful for all your time and effort you put into it". Testimonial. L&D from their Wedding at the Grand Hotel Cap Ferrat. 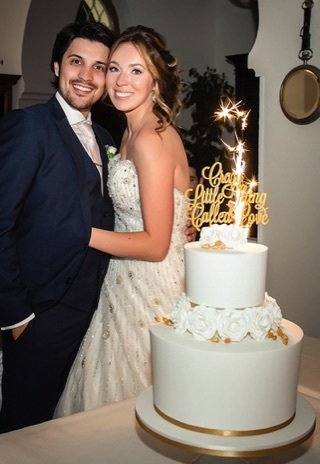 "Just wanted to say a very big thank you for our beautiful wedding cake!!! It was absolutely stunning, so beautiful and tasted delicious!!!" Testimonial. S & A from their Wedding at Chateau St George. "I just wanted to say a quick thank you for the absolutely STUNNING wedding cake - it surpassed our greatest expectations!!! .................. I have never eaten such a delicious cake in my life!!! ......Thanks again for making our Wedding dream come true!!!" Cake style idea : Liz. Smooth, polished, fondant icing on this huge, delicious cake provided the perfect backdrop for the gorgeous fresh flowers at Chateau Diter. Cake style idea : Manon. 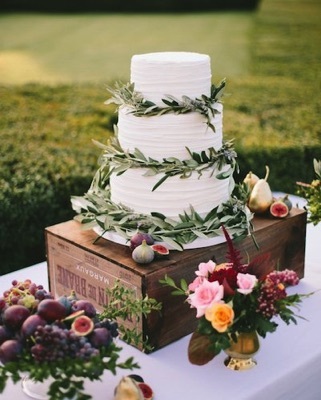 This lovely, royal iced wedding cake, dressed with fresh lavender & olive sprigs, captured the spirit of Provence. Cake style idea : Melissa. A beautifully detailed wedding cake incorporating the bride & groom's initials and many tiny pieces of piped lace. At Villa Ephrussi de Rothschild. Testimonial. Event organiser for Wedding at Hotel Cap Estel. It was a pleasure working with you and getting your options and your design input and ideas! Thank you for that and for being so flexible. Merci beaucoup and I look forward to working with you again". Cake style idea: Nicole. A chic and elegant wedding cake created to the designer bride's exact specifications. © 2018. Wedding Cakes By Pamela. Bargemon. France. Cake style idea : Marta. 'Crazy Little Thing Called Love' for the gorgeous photographer Bride & handsome musician Groom at Villa Mauresque. Cake style idea : Jane. 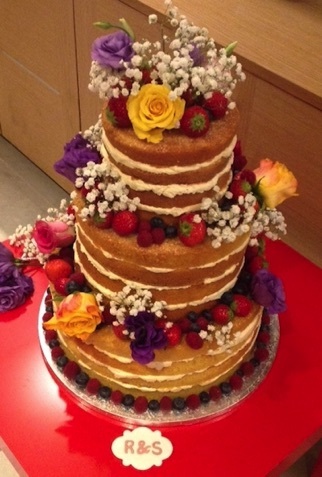 A simply delicious naked cake dressed only with fresh fruit & flowers.